Lessons in Lasting Relationships from the Bible’s Most Notable Married Couples - What makes a marriage wonderful? Do the lives of the Bible’s married couples hold keys to cultivating a love that will last a lifetime? 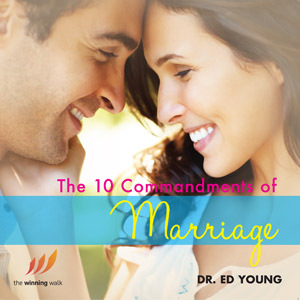 In 10 Commandments of Marriage, Dr. Ed Young shares the “thou shalts” and the “thou shalt nots” of successful relationships – straight from the pages of God's Word. Long-married couples will find love-building precepts that will revive a failing marriage and make a great relationship even better. Soon-to-be-marrieds will discover what marriage is all about, and gain priceless insights into starting on solid ground. The truth is, marriage is stronger when spouses stand together. The truth is, forgiveness breathes life into your marriage. The truth is, God wants your marriage to sizzle. The truth is, a happy marriage starts with selflessness.